We're taught as children that you always say "thank you" for a gift. Children may be able to get away with a verbal thank you or template-like letters. But your nonprofit can't. If my 10-year-old niece were a nonprofit, you can bet that I'd support her cause. Let me tell you why. Last month, I received a picture via iMessage from my niece. 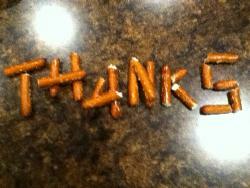 She had spelled out "THANKS" with pretzel sticks. That's all she sent. And it's all I needed. A picture really is worth a thousand words. Really Mean It When You Say "Thank You"
The pretzel thank you was an acknowledgement of a package that I had sent to her and her 6-year-old brother for the holidays. How exciting it is to be the child (or nonprofit) who receives a gift! And how thrilling to be the aunt (or donor) who gets a sincere thank you that conveys that excitement and genuine appreciation. The pretzel picture actually came BEFORE the package was ever unwrapped. 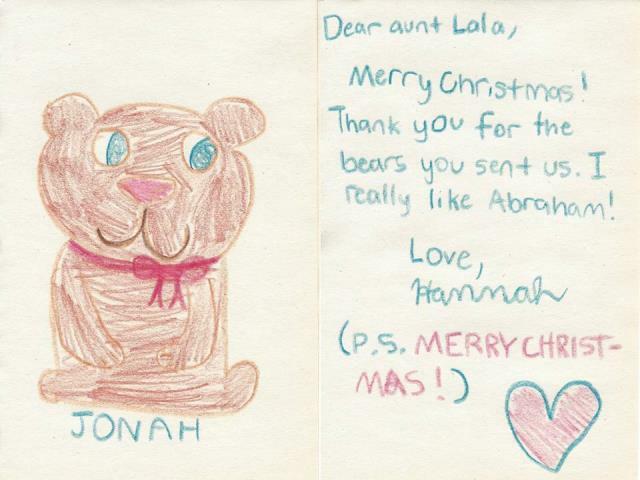 Then, a week or so later, I received a handwritten card where my niece had drawn a picture of the gift. Wow! Two expressions of thanks for one gift? At 10 years old, my niece already shows her appreciation for each and every gift she receives. Every thank you is as unique as the child. And, as the gift giver, that honest and heartfelt expression of thanks means a lot to me. So, you can bet that when the next occasion presents itself, I will send her another gift. Not because I have to, but because I want to. Will your donors want to send your nonprofit another gift? Do they know how very much you appreciate them? To make sure they do, throw out your stale templates and send a sincere (and don't forget, timely!) note of thanks. Surprise them, whether it's through your words, your actions or both. And never, ever stop saying thank you to each and every donor, for each and every gift. Send me a message and tell me some of the creative ways that you'll be thanking your donors in the new year. I love hearing from you. Just like there's more to grant writing than just "writing," there's also more to fundraising than just grants. And an important part of fundraising is the art of saying "thank you." Make it your New Year's Resolution to follow these three inspiring and thought-provoking nonprofit communicators: Tom Ahern, Kivi Leroux Miller and Katya Andresen. Their names link to posts specifically about thank you notes. Read their work. It's a resolution that you can keep...and you'll be glad you did. In the meantime, here are three links to interesting blogs and articles that will help you thank your donors (and keep them coming back) in the new year.